There appears to be a paradigm shift in the counterinsurgency strategy being employed by the U.S. forces in Iraq. This shift goes further than the changes associated with the security plan of which many observers are aware (e.g., deployment out of Forward Operating Bases into the cities to combat operation posts). The changes point to a fundamental shift in the way the U.S. sees the battle for Iraq. The schema until now seems to have been focused on the notion that the Iraqi people, separated from the rogue elements in their midst, long for freedom and self-determination, with al Qaeda in Iraq, Ansar al Sunna, and foreign suicide bombers standing in their way. Defeating the insurgents has primarily been seen as defeating AQI. One need only to go back through the Multi-National force press releases to see how many references there are to AQI. But it is becoming increasingly clear that this schema bears little resemblance to the realities on the ground in Iraq. With AQI and AAS standing only at several thousand, for a country the size of Iraq, there simply aren’t enough to pull off destabilization of a country. There are more gang members in most medium size American cities than there are al Qaeda in Iraq. Until recently, the Sunni militants were seen in the role of assisting AQI, but the view seems to be changing to one of the disaffected Sunnis (i.e., Fedayeen Saddam, former Iraq security police, former senior Iraqi army leadership and hard line Baathists) being primarily in the lead with AQI and AAS being secondary in their affect and power. There are reports that the security situation in Ramadi might be improving. Once again, AQI is mentioned as of paramount importance regarding the security situation in Ramadi, but the NewsDay article ends with an interesting admission concerning the Anbar province and other areas of Iraq. The U.S. military has struggled for nearly four years to secure this city, which had become a magnet for Sunni insurgents and a lawless haven for al-Qaida militants. Now – slowly, and in halting steps – something appears to have given way. At least by its own tortured standards, Ramadi seems to be calming. “It’s much safer than it was, but is it perfectly safe? No,” said Army Col. John Charlton, the commander responsible for the city 75 miles west of the capital. Ramadi offers a snapshot of the Pentagon’s latest strategies to quell violence in Iraq. Neighborhoods are being walled off to keep insurgents out. Military units are moving off major bases and setting up smaller U.S.-Iraqi posts in violent areas downtown. While the U.S. military claims progress, Ramadi remains a place where fear shadows even commonplace acts. Shoppers and school children carry white flags in desperate attempts to show neutrality. “A lot of people are still scared in their hearts,” said Mahmoud, an elderly man who gave only his first name. In large part to allay those fears, Charlton said 70 percent of U.S. forces live downtown. “We used to go on patrols and get shot at, then go back to base, eat chow and do it all again,” said Army 1st Sgt. Michael Jusino, also in Ramadi two years ago. “But we realized … you have to go into the city and stay there.” Suicide bombers still strike, the most recent one on April 6. But troops show off graphs indicating a recent turnaround in violence. Compared to 20 to 30 daily attacks a year ago, now there often are just a few bursts of small-arms fire in a day. Marine Brig. Gen. Charles Gurganus, commander of U.S. ground forces in Anbar, said insurgents who fled Ramadi are still in Anbar. As I have discussed before, Fallujah is currently a hot spot of insurgent activity, so some of the Sunni fighters have fled from Ramadi only a few kilometers East. Another hot spot is Baqouba, in the Diyala Province. They maneuver in squads, like the U.S. infantrymen they try to kill. One squad fires furiously so another can attack from a better position. They operate in bad weather, knowing U.S. helicopters and surveillance drones are grounded. Some carry GPS receivers so mortar teams can calculate the coordinates of U.S. armored vehicles. They kidnap and massacre police officers. The Sunni guerrillas and extremists who now dominate this city demonstrate a sophistication and lethality born of years of confronting U.S. military tactics. While the “surge” plays out in Baghdad just 35 miles to the south, Baqouba has emerged as a magnet for insurgents from around the country and, perhaps, the next major headache for the U.S. military. Some insurgents have moved into Baqouba to escape the escalation in Baghdad. But the city has been attracting insurgents for years, and particularly after U.S. officials in Baghdad proclaimed it and surrounding Diyala province relatively pacified more than a year ago and drew down their troop presence. When 70 insurgents broke out of a Mosul jail last month, for example, escapees from Chad, Yemen, Syria and Afghanistan were apprehended here, the Iraqi police said. And Sunni fighters continue to heed calls by insurgent leaders to converge here. It is impossible to say how many insurgents there are in Baqouba now. Some military officials put the number around at least 2,000, a nasty stew that includes former members of Saddam Hussein’s army and paramilitary forces, the Fedayeen; angry and impoverished Sunni men; criminal gangs; Wahhabi Islamists; and foreigners. That is similar to the number of insurgents in Fallujah in 2004, before a bloody Marine offensive to retake the city, said Lt. Col. Scott Jackson, deputy head of the provincial reconstruction team in Diyala, who fought in Fallujah. As the insurgent ranks have swelled, attacks on U.S. troops have soared. The 5,000-strong brigade that patrols Diyala province has had 44 soldiers killed in five months, more than twice the number who died in the preceding year. The much-heralded tribal split with al Qaeda is a positive sign in the Anbar Province, but it must be remembered that even if AQI loses in this showdown, the insurgency is not defeated. One side of the insurgency has merely gained supremacy over the other. This modified schema of seeing the insurgency as being primarily borne on the shoulders of disaffected Sunnis is supported in this informative and interesting report by Michael Totten from Kirkuk (Patrick Laswell has an equally interesting report from Kirkuk). In an odd occurrence today, Defense Secretary Robert Gates argued that diplomatic efforts to resolve the nuclear standoff with Iran are working and should be given a chance to succeed. This pronouncement comes on the heels of an announcement by General Peter Pace that Iran is supplying weapons and other support to insurgents in both Iraq and Afghanistan. Just why Gates feels that whatever bargains are struck with Iran can be relied upon when Iran has denied a thousand times that they are involved in Iraq is not manifestly obvious. But a far better indicator of the danger that lies ahead may be found the in reaction of Iran’s neighbors. There appears to be a mad rush throughout the Middle East to go nuclear. Two years ago, the leaders of Saudi Arabia told international atomic regulators that they could foresee no need for the kingdom to develop nuclear power. Today, they are scrambling to hire atomic contractors, buy nuclear hardware and build support for a regional system of reactors. So, too, Turkey is preparing for its first atomic plant. And Egypt has announced plans to build one on its Mediterranean coast. In all, roughly a dozen states in the region have recently turned to the International Atomic Energy Agency in Vienna for help in starting their own nuclear programs. While interest in nuclear energy is rising globally, it is unusually strong in the Middle East. The Strategy Page has an interesting rundown on the current state of affairs within the DoD naval complex, and this rundown is both informative and incomplete at the end in its analysis. I will have to duplicate the article at length in order to comment on the conclusions. April 15, 2007: Whatever happened to the destroyer? They seem to be disappearing. Part of the reason is cost, but there’s also the political correctness angle. Warships called destroyers appeared a century ago and by the end of World War I they were ships of about 1,000 tons armed with a few guns, some torpedoes and anti-submarine weapons. By World War II, destroyers had grown to about 3,000 tons. There were also “Destroyer Escorts”, which were half to two-thirds the size of destroyers. The larger types of surface warfare ships were cruisers, weighing in at between 6,000 and 12,000 tons, and battleships, which were 30-40,000 tons. Half a century later, all that’s left for surface warfare are destroyers and frigates, plus the usual assortment of smaller coastal patrol boats that have always been around. For whatever reason, the modern frigates perform the same mission (and are about the same size) as the World War II destroyers. However, most Western navies don’t even like to use the term, “destroyer” any more. Warships displacing 3-5,000 tons are increasingly called frigates. Sounds less warlike, or whatever. Meanwhile, the modern destroyers have grown to the size of World War II cruisers. Actually, some of the larger destroyers are called cruisers, even though they are only 10-20 percent bigger than the largest destroyers. The latest ships in the U.S. Navy’s Burke class destroyers weigh 9,200 tons, cost $1.5 billion each to build, have a crew of about 330 sailors, carry 96 (a combination of antiaircraft and cruise) missiles. There’s only one 5 inch gun, but two helicopters. These modern destroyers could take on any World War II cruiser and win, mainly because the cruise missiles have a range of 1,500 kilometers. A Burke class ship could probably defeat a World War II battleship, although we’ll never know for sure since one of those heavily armored ships never got hit by a modern cruise missile. In effect, the U.S. Navy has settled on just three major combat ship types; aircraft carriers, destroyers and nuclear submarines. The original cruisers of a century ago displaced less than 10,000 tons, but by World War II, that had increased by 50 percent. Two decades ago, the U.S. Navy reclassified its Ticonderoga class destroyers, which eventually displaced 10,000 tons, as cruisers. Now the U.S. wants build a new class of destroyers, the DDG-1000, that displace 14,000 tons. These ships will be 600 feet long and 79 feet wide. A crew of 150 sailors will operate a variety of weapons, including two 155mm guns, two 40mm automatic cannon for close in defense, 80 Vertical Launch Tubes (containing either anti-ship, cruise or anti-aircraft missiles), six torpedo tubes, a helicopter and three helicopter UAVs. The problems is that these new “destroyers” will be very large ships, and will cost over $2 billion each. At the same time, the new LCS (Littoral Combat Ship) is sort of replacing the Oliver Hazard Perry-class frigates. The Perrys are 4,100 ton ships that would cost about $200 million to build today. The big difference between the frigates and LCS is the greater use of automation in the LCS (reducing crew size to 75, versus 170 in the frigates) and larger engines (giving the LCS a speed of about 90 kilometers an hour, versus 50 for the frigates.) The LCS also has a large “cargo hold” designed to hold different “mission packages” of equipment and weapons. The Littoral Combat Ship is, simultaneously, revolutionary, and a throwback. The final LCS design is to displace about 3,000 tons, with a full load draft of under ten feet, permitting access to very shallow coastal waters, as well as rivers. This is where most naval operations have taken place in the past generation. Max range is 2,700 kilometers. Built using commercial “smartship” technologies, which greatly reduce personnel requirements, the LCS is expected to require a crew of about 50 in basic configuration, but will have accommodations for about 75 personnel. The ship is designed for a variety of interchangeable modules, which will allow the ships to be quickly reconfigured for various specialized missions. Crews will also be modularized, so that specialized teams can be swapped in to operate specific modules. All this is happening at a time when the U.S. Navy is increasingly unhappy with the performance of American ship builders. Costs are rising sharply, quality is down and the admirals can’t get satisfactory answers from the manufacturers. For example, the new class of destroyers, the DDG-1000 class destroyers have also faced ballooning costs, up to as much as $3 billion per ship, as opposed to original planned costs of $800 million each. The current Arleigh Burke-class destroyers only cost $1 billion each. The LCS was planned (a few years ago) to cost $200 million each. That price has now doubled. The LCS is, what the original destroyer was. A small, inexpensive vessel that could do a lot of dangerous jobs the more expensive ships could now avoid. But unless the navy gets its shipbuilding costs, and quality, under control, it won’t be able to afford a new class of destroyers. Unless, of course, it has an attack of common sense, and calls the LCS destroyers, and the DDG-1000 ships cruisers. Regardless of the less rational reasons for or against retirement of the battleships, the history of the engineering and construction of these huge ships, and indeed, the very nature of engineering and construction, argues for the continuing viability of these vessels and against wholesale replacement. This is true regardless of whether destroyers are constructed and commissioned. AUSTRALIA’S defence chiefs are already reconciled to a long-term Australian military presence in Afghanistan. Yesterday’s announcement of a return of special forces to Afghanistan confirms that that country remains at the centre of Australia’s military contribution to the global jihadist war. The SAS and the commandos are essential to ensuring that our engineers and trade specialists can go about their civic rebuilding tasks with the support of localAfghans. The ground forces are sustained by headquarters, intelligence and logistics staff, as well as vital air support, bringing the total size of the force to at least 1000. The experience of the past few months has shown that without aggressive, long-range patrolling and intelligence gathering by Australian special forces, the threat posed by Taliban insurgents in Oruzgan province will soon rebound. Tight rules of engagement for a number of NATO countries, including The Netherlands, inhibit their combat forces from taking on the Taliban in offensive operations. We will revisit this last sentence in a few moments. In a recent article in Harper’s Magazine, defense policy expert Edward Luttwak weighs in on the current conflict in Iraq in an interesting article entitled Dead End: Counterinsurgency Warfare as Military Malpractice. After recognizing that involvement of NGOs (non-governmental organizations) and effective political machinations are necessary for victory in any counterinsurgency, he makes the following observation that becomes seminal for his article. Cuba, Libya, North Korea, and Syria shows that in fact government needs no popular support as long as it can secure obedience. As for better government, that is certainly wanted in France, Norway, or the United States, but obviously not in Afghanistan or Iraq, where many people prefer indigenous and religious oppression to the freedoms offered by foreign invaders. So this is how it all ends? Boot Camp at Parris Island, leading to School of Infantry, leading to the fleet and all of the ranges and training, leading to … Iraq. It is hard even to know how to begin to express my feelings. My usually quick hand taps the keyboard in boredom and listlessness as I try to write this post. My mind, usually capable of handling Alvin Plantinga and Paul Helm, darts from one disconnected thought to another, and my prayers have become literally childlike-simple, even utterances and mumblings and repitition. Sleep comes very hard these days. When trying to figure out how we felt, the only thing to which my wife and I could make a comparison with the deployment of our son was a recent death in the family. The fatigue, the sickness on the stomach, the sadness; deploying him has been like enduring a death in the family. The mere thought of silly and trite television viewing makes be sick, and I want more than anything else information about the war. Not the biased and leftist information from the main stream media, nor the cheerleading sis-boom-bah reporting from the conservative web sites. No, I want the truth … and frankly, I think I am entitled to it. I have followed Operation Iraqi Freedom for a while, writing as often as I could to express both agreements and disagreements, make observations, and give my readers an alternative view of the things that are transpiring in Iraq. In the time I have been writing I have had to learn about counterinsurgency, MOUT, snipers, EFPs, body armor, rules of engagement, nonkinetic operations, squad rushes and room clearing tactics, Iraqi geography and the differences between Sunni and Shi’a. I have jettisoned my reading list and picked up the Small Wars Manual and the recently published Counterinsurgency Manual. My favorite e-mails are from people discussing military matters – because nothing else much matters at the moment. It is hard to know where to go from here. I spend much time in prayer and some time in fasting. But writing? It has been too difficult, and I have not posted in some time. I recall the counsel that Donald Sensing gives concerning writing on a web log: do it mainly for yourself. If others benefit from your journal, then so much the better. I suppose I will keep doing this, albeit at a slower pace. My wife and daughter think I am driving myself crazy with my study of the war. My other son Joshua thinks that if I don’t study and write I will drive myself crazy. Perhaps they are all wrong and I am already crazy. In the end, my son deserves to be mentioned in my journal, so as hard as it was to send him off, here it goes. We showed up in Jacksonville, N.C., on Saturday morning to begin our last visit with Daniel before he deployed. It was good to be with him. Not good in the usual sense of the word. Our words flow too quickly and without serious thought when we aren’t under duress. No, it was really good to be with him. The visiting actually started the weekend before when we met him at the beach, family and friends, to spend quality time together. This time it was different than previous visits. The stress was gone, and the preparations for what was going to happen were completed. There was only the here and now, the time to sit at the beach and talk and play football, the opportunity to grill steaks and enjoy meals together. But the weekend we saw him off things moved apace. Backpacks and sea bags were packed, geared was stowed away, and weapons were checked out of the armory. He and I did manage to slip in a movie, and along with a Corporal in his unit who stayed with his family, Daniel stayed with us in the hotel the night before he deployed. Again, it was good to be with him. We kept his truck, and getting up at 0430 hours to get him back to Camp Lejeune wasn’t exactly in the plan, but I adapted with the help of some caffeine. When my wife and I went back later in the morning to the parking lot between the barracks and the New River, we arrived to a mountain of backpacks and sea bags, M16s, SAWs, cars and families seeing their sons or husbands off. Daniel tailgated with us for a while, and we got in another meal with him at our car. Pictures were taken, families huddled up, and hugs were frequent in the parking lot that day. A truck showed up, and backpacks and sea bags quickly made their way via a chain of Marines to be loaded up. Contrary to the predictions, the busses arrived as scheduled. Seeing them get on the bus was the hardest part. My wife cried, and as I turned to look at the mother of the Corporal who stayed in the hotel with us the previous night, she was crying as well. [This was the Corporal’s third combat tour. Note to self concerning subsequent deployments: this doesn’t get any easier.] Wives were distraught, but the men were jacked up and ready to go. The busses rolled out soon after arrival, and then it was over. The long drive home was lonely. The exhaustion and preoccupation the remainder of the week was debilitating, and remains so to some degree. I guess I expected much of this. What I really didn’t expect was the reaction of some people to my son’s deployment. Perhaps I should have known. 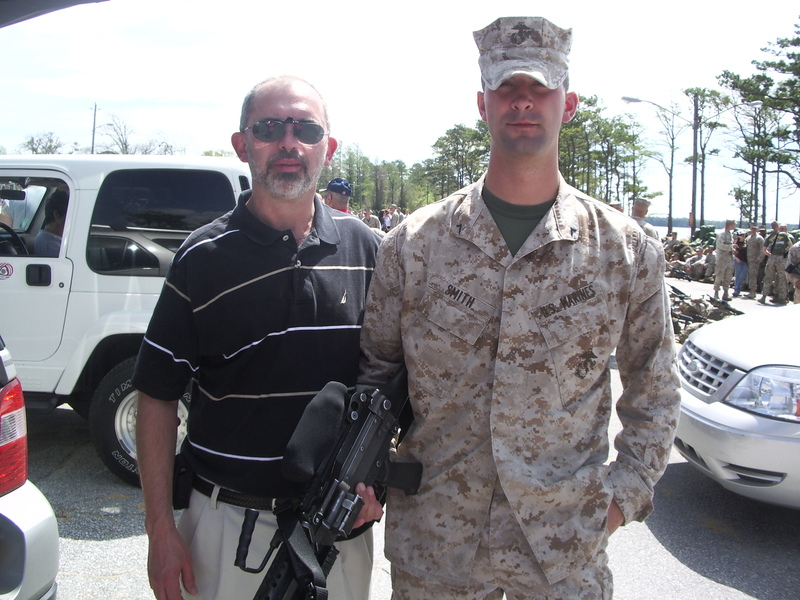 I recall a fellow marine parent from Connecticut wrote me once and expressed surprise at the reaction of his ‘friends’ to his son’s deployment. In Connecticut, he said, many people saw the war as criminal adventurism, and he and his wife literally lost friends due to his son’s involvement in the war. My son Josh made an insightful observation about this, responding to me that this father didn’t really lose friends; he weeded out the worthless. With us it hasn’t taken on quite as draconian a form as that. It is more subtle. At first my wife wondered why those strange people were giving her those strange looks and gestures, until she saw what they were looking at when they did those things: her USMC car tags and stickers – things that Daniel calls moto-gear (motivational stuff that he wouldn’t be caught dead sporting … his only moto-gear is a USMC tattoo in Old English down the back of his left arm). But there is an even more subtle form of disrespect that has become apparent to us. Ignoring us, our son’s service, and the cost to our family. To be sure, some people at work mention it and tell me they’re praying for his safety. Some people at church do as well. Were it not for our small group fellowship at church, we probably couldn’t make it. But for those long time ‘friends’ at work and (yes, even at) church who, after hearing us mention our son, fail even to say a word, much less say they will pray for us, it causes me to wonder how I could have ever considered those people friends. How odd this seems to me. How could my discernment have been so poor? Now there is only the waiting, and hoping that a fateful phone call or visit doesn’t happen. It is the not knowing and not hearing that makes this so hard. All we can do is pray, write to him and pray some more. And lean on our true friends. I would go to Iraq in a heartbeat to write and report, but don’t even know how to make such a thing happen. For the time being, my body is at work every day, but my heart is in a place I’ve never been. Iraq. Just before the busses arrived, a pile of sea bags in the background, SAW in hand.